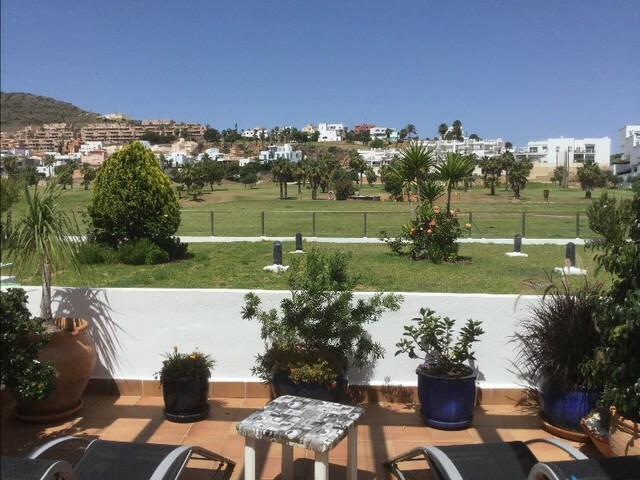 Fabulous top floor apartment for sale on Oasis Residencial on Mojacar Playa, Almeria, Andalusia with wonderful south facing terrace with sea views. This apartment is within easy walking distance of restaurants, bars and shops as well as the promenade and the best beaches in Mojacar. Stairs take you up to the front door of the first floor apartment (top floor) and you go into the open plan lounge - diner - kitchen. The kitchen is modern, fully fitted and equipped with a breakfast bar dividing the kitchen from the dining area. The apartment is light due to the south facing aspect and assures all day sun. French windows give access from the lounge to the good size terrace with sea and coastal views. The terrace looks over the small park and playground opposite. This is a lovely quiet, residential cul-de-sac. There are 2 double bedrooms with fitted wardrobes both looking onto the terrace. The master bedroom has access to the terrace through patio doors and an en suite bathroom with bath. There is a second shower room with shower cubicle. The apartment comes with an alloted off - street parking space. The community benefits from having 2 communal swimming pools and all day sun. This apartment is an ideal holiday home, very easy to lock up and go, or has great potential for holiday rentals due to fabulous location and south facing orientation.